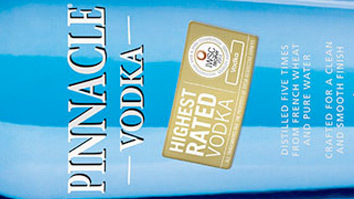 Award-winning Pinnacle® Vodka starts with the finest wheat grain from France and is five times distilled for an incredibly clean, smooth taste. It’s everything you’d expect from premium vodka, but with none of the attitude and at a delightfully unexpected price. Over 40 distinct flavors, from fresh and fruity Tropical Punch and Raspberry, to indulgent Whipped®, Cake, and Cinnabon®, make Pinnacle® Vodka endlessly mixable for a new, exciting experience every time. No matter what the mood or occasion, whether it’s drinks on the patio or an epic night out, Pinnacle® Vodka is an invitation to celebrate the things that inspire you. Be playful, be inventive. No matter how you choose to express yourself, we have a vodka for that.